The presence of large aggregations of mantas feeding on tiny plankton in waters around coral reefs is one more indication that the plankton populations around those coral reefs are rich and abundant. A live postcard from MACNA 2013 in South Florida, this short video by John Carlin catches the flavor of the exhibition hall, where startling corals, tiny cuttlefish and marine salesmanship vied for the attention of an estimated 2,500 attendees—a record turnout in the 25-year history of the event. 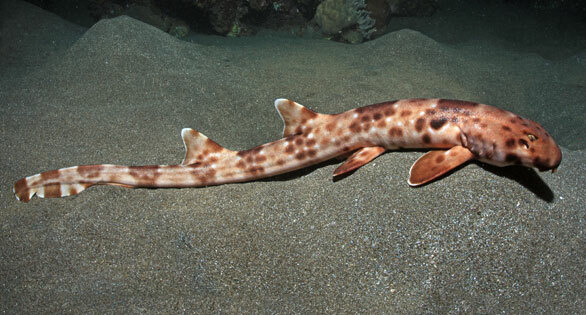 A highly charismatic species of walking shark has been discovered in the remote eastern Indonesian island of Halmahera. The epaulette (long tailed carpet) shark, Hemiscyllium halmahera, uses its fins to “walk” across the ocean floor in search of small fish and crustaceans.